No student loan payments and my credit card debt is up to 4056.11. 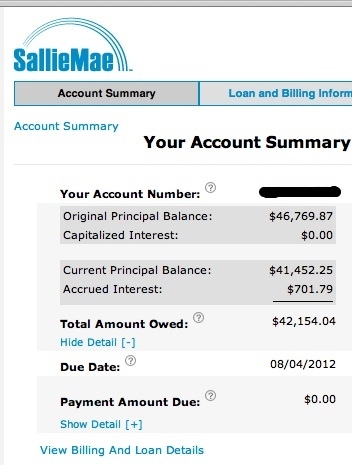 Student loan total is 42154.04. Combined that’s 46210.15. On the plus side, I have 4 new tires on my car that are good for another 3 years at least, a new 2.96lb computer I don’t mind at all blogging on that will easily last me 2 years, and I am a homeowner. Depending on how many bones I rack up and the pending car repair, my credit card will be paid off around the end of the month and at the latest, by the time I get paid after that. Clarification: I also have 2k in savings right now, something I didn’t have in April. So assuming I put aside all my cash toward debt today I’d be at $44210. OT, I did something stupid a few days ago. Dropped my iPhone onto concrete, face down and the screen cracked. Almost 2 years without any big problems. A young chinese man in Dallas fixed it for $81.00 and had it done in about 20 minutes. I thought it was $35 originally, but that was only for the 3G/3Gs models. For me it was worth it. Way cheaper than an Apple Store and supporting the little guy. Eating out less this week than last. It helps to have a functional kitchen. $20 a pop at Panera, etc and $5-15 between breakfast and lunch was starting to get to me. Really need to integrate the gym back into my routine. The workout room in our complex is a minute walk from our front door and I’m pretty sure there is at least one track nearby. Biggest obstacle for me has been inflammation in my knees (tendonitis). Started taking Flax Seed Oil, Vitamin C and orthotics (yeah I’m old) a day ago and it seems to be getting better.